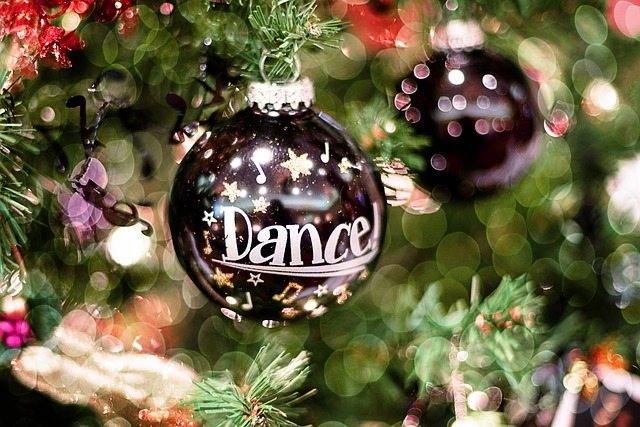 Simple self-care during the holidays can reduce stress and keep you energized. Is your own self-care even on your holiday list? If you are the type to put everything and every one else first, you probably do so even more at holiday time, and your answer to that question is likely “NO”. 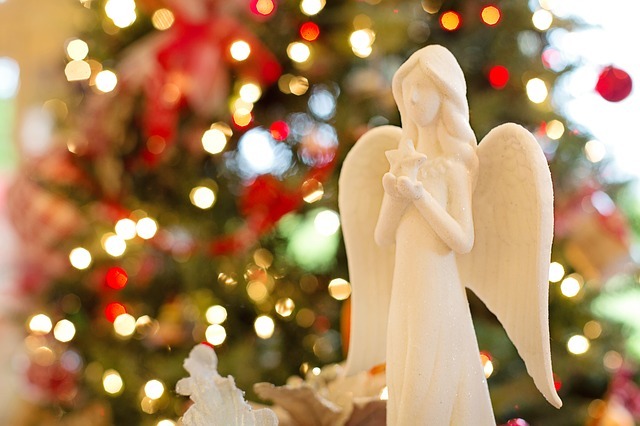 Simple self-care during the holidays can help reduce stress, and energize you. Then, you may even find you get more done in less time because you are more effective and efficient. Putting yourself on your list can be simple and effortless. You don’t need to buy anything, schedule hours into your day, nor go anywhere. There are some tips for simple self-care during the holidays you can incorporate effortlessly into your routine that will help minimize the effects of stress. Simply minimizing the effects of stress can help short term. Minimizing the effects of stress does not have the lasting effect that getting to the roots of your stress does. But, it can help short term until you take the needed time to resolve your issues at the roots for long-term, lasting results. First, it is important to recognize some of the signs that you may be stressed. Your innate drive to serve and care for others is likely amped up, fueling your desire to make the holidays perfect and wonderful. For others. Yet, feeding your deep desire to make the holiday wonderful for others may not be enough to nourish all of your own needs for self-care during the holidays. You may feel good about what you have done on one hand, yet drained and irritable on the other. Breathe deeply. Deep breathing can trigger a natural relaxation state. Ground and center yourself. Take a moment to really feel present, in the moment, connected to Source, and to Earth. Smile. This actually tricks your nervous system into a state of feeling happy. Did you just smile? Turn on the music. Sing or whistle an inspiring or upbeat tune. Dance as if no one were watching. Savor your morning routine. Start your day off positively. Really savor your morning routine – a cup of tea, meditation, prayer time, your shower, applying a favorite moisturizer, the sunrise, the promise of a new day. Really take it in. Have fun. BE in the moment. Find something you can appreciate with your senses, such as a new pleasant scent, something beautiful in nature, a new sight, a new flavor, the coziness of your sweater, the sounds, the silence, etc. Be gentle with yourself and realistic with your expectations. Don’t beat yourself up for your choices and outcomes. It is great to notice your feelings around your perceived shortcomings. Holidays aren’t the time to change dramatically (though you can choose to feel gratitude for the insight into your own ways). HINT: Set your intention to dig deep here at a better time for handling it – say in the New Year? Request a complimentary consultation for a Discovery Session with me to explore how life coaching may help with expectations, intentions, and goal-setting in the New Year. Know and honor your values, and set your priorities according to them. What is REALLY important? If you honor your values, you will feel more fulfilled, confident, and less stressed. Eat and drink as healthy as possible, focusing on what you DID eat “right”. Have an extra glass of water to maintain your hydration. Try smaller portions, and eat mindfully. If you give yourself a minute to really savor that one cookie, or piece of candy, you may not really want another….. Choose the feeling you DO want to experience when all is said and done, and create it for yourself. How? First, identify the feeling. Perhaps it’s gratitude, peace, joy, or even can’t be put into words. Then, using your imagination, assuming anything is possible, imagine actually having that feeling, being in the situation that would create it. These tips for simple self-care during the holidays can help mitigate the effects of stress short-term, but you need to get to the roots for lasting results. Ultimately, your beliefs about your situation, expectations, choices, options, experiences, etc., are what create stress, and must be dealt with realistically to resolve stress at the roots. Taking the plunge into exploring what makes you tick takes time, and commitment, but has its long term rewards in satisfaction, health, joy, and peace. Put yourself on your list….. Consider being as generous with yourself as you are others. Your health matters. You can’t give as much, as well, to others from a an empty box…. 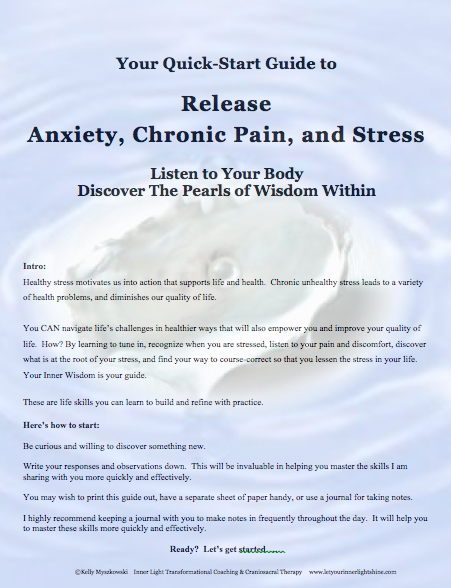 Gift yourself a copy of my free “Quick-Start Guide to Release Anxiety, Chronic Pain and Stress” to start. Grab your copy here. You will also be among the first to be able to register for my upcoming free program in 2017 for long-term stress resolution! Fatigued, tense, drained? Craniosacral therapy helps your nervous system re-set to a healthy new de-stressed way of being. Overwhelmed? Time for a change? Transformational life coaching helps you think and BE in healthier less stressed, more energetic and peaceful ways. Feeling the need to stop, take a breath, get some perspective, and start fresh with healthier new ways of BEING? A well-being program combining the two approaches can help you not only feel better short term, but BE better long term. Contact me for a complimentary Discovery Session today to discuss your needs and possible solutions for long-term stress resolution. Which tips resonate best with you? Which do you find most useful? Feel free to comment below! Love to hear from you!